In collaboration with the Gotlieb Center, BU's Creative Writing Program is proud to present a Robert Lowell Memorial Poetry Reading by Prize-Winning Poet Jane Hirshfield and recent BU alum Natasha Hakimi, with an introduction by Robert Pinsky. Reading followed by book signing and dessert reception. Free and open to the public. Join us for a very special seminar presented by the HGARC Student Advisory Council and Professor Victor Coelho in an exploration of Jazz. This seminar gives students a chance to touch, hold and read original letters, manuscripts, journals and photographs from noted musicians, critics and historians, including Ella Fitzgerald, Cab Calloway, Sylvia Dee and Henry Pleasants. The seminar takes place Tuesday April 10, 2018 at 6:00 p.m. in the main reading room of the Howard Gotlieb Archival Research Center. In collaboration with The HistoryMakers, The Howard Gotlieb Archival Research Center presents a program dedicated to Martin Luther King, Jr. on the week of remembrance of the 50th Anniversary of his assassination. Come hear Professor of History, Race and Public Policy at Harvard Kennedy School, Khalil Muhammad interview renowned Poet Nikki Giovanni on Dr. King's dream and discuss what the dream is today. The program will also include an exhibition of Dr. Martin Luther King Jr.'s archive. Join archivist Claudia Willett and Professor Alexis Peri in an exploration of the lives and work of some remarkable women who challenged gender stereotypes and impacted history. Trailblazing Women is a Student Discovery Seminar where students can touch, hold and read original letters, manuscripts, journals and photographs from noted activists, journalists and world travelers, including Emma Goldman, Florence Nightingale, and Martha Gellhorn. The seminar takes place Thursday March 22, 2018 at 6:00 p.m. in the main reading room of the Howard Gotlieb Archival Research Center. Join William M. and Sara B. Warren Professor of the Humanities and celebrated Bob Dylan expert Christopher Ricks for the second conversation about Bob Dylans The Bootleg Series, Trouble No More 1979-1981, the eleven disk set released in 2017. Part I on February 27 is entitled You Know Who He Is, and Part II on Tuesday March 20 is entitled Slow Trains Coming. Lawrence O'Donnell hosts The Last Word with Lawrence O'Donnell on MSNBC. Each night, O'Donnell relies on his extraordinary background in politics, entertainment and news, to provide the last word on the biggest issues and most compelling stories of the day. O'Donnell joined MSNBC as a political analyst in 1996. O'Donnell has also appeared on Today, Good Morning America, Nightline, Charlie Rose, Countdown with Keith Olbermann, Morning Joe and several other programs. Born in Boston, O'Donnell is a graduate of Harvard College, where he wrote for The Harvard Lampoon. His first foray into politics was as Director of Communications in Senator Daniel Patrick Moynihan's 1988 re-election campaign. From 1989 - 1992, O'Donnell served as Senior Advisor to Senator Daniel Patrick Moynihan and then was Chief of Staff to the Senate Committee on the Environment and Public Works. He was later the Chief of Staff of the Senate Finance Committee from 1993 - 1995. A writer prior to entering politics and government, O'Donnell published the 1983 book Deadly Force, which was adapted as a CBS movie in 1986. He has written essays and articles for several publications including The New York Times, Washington Post, Los Angeles Times, New York Magazine, People, Spy, and Boston Magazine. In 2017, O'Donnell published the book, Playing with Fire: The 1968 Election and the Transformation of American Politics. O'Donnell was also an Emmy Award-winning executive producer and writer for the NBC series The West Wing and creator and executive producer of the NBC series, Mister Sterling. Mr. O'Donnell will sign copies of his latest book, Playing with Fire: The 1968 Election and the Transformation of American Politics, which will be available for purchase. Join William M. and Sara B. Warren Professor of the Humanities and celebrated Bob Dylan expert Christopher Ricks for the first of two conversations about Bob Dylans The Bootleg Series, Trouble No More 1979-1981, the eleven disk set released in 2017. Part I on February 27 is entitled You Know Who He Is, and Part II on Tuesday March 20 is entitled Slow Trains Coming. Come and explore the lives - both on and off set -- of legendary partners from the stage and screen. Material from the collections of Geena Davis, Robin Williams, Lauren Bacall, Leonard Nimoy will be on display so we can explore these amazing real and fictional figures - Thelma and Louise, Aladdin and the Genie, Bogie and Bacall, Kirk and Spock - that while amazing on their own, came together and made history. 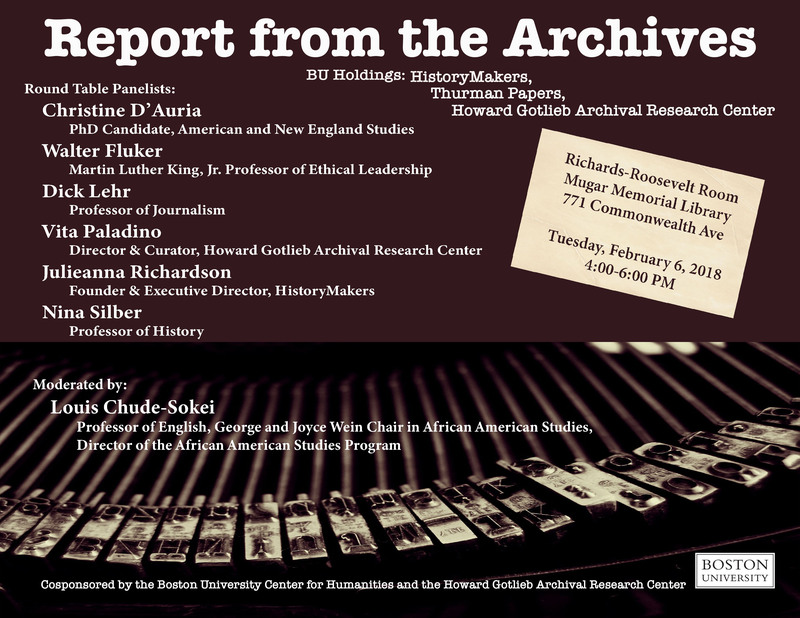 BU Center for the Humanities presents Report from the Archives, a round table discussion of archival work featuring the HistoryMakers, the Howard Gotlieb Archival Research Center, and BU faculty from across the university. This event is free and open to the public. Co-sponsored by the Howard Gotlieb Archival Research Center. Author Jefferson Morley on "The Ghost: The Secret Life of CIA Spymaster James Jesus Angleton"
Jefferson Morley is a journalist and editor who has worked in Washington journalism for over thirty years, fifteen of which were spent as an editor and reporter at The Washington Post. The author of Our Man in Mexico, a biography of the CIA's Mexico City station chief Winston Scott, Morley has written about intelligence, military, and political subjects for Salon, The Atlantic, and The Intercept, among other publications. He is the editor of the blog JFK Facts. Morley will discuss his latest book, The Ghost: The Secret Life of CIA Spymaster James Jesus Angleton. Philip Shenon, author of A Cruel and Shocking Act, says of the book, "The Ghost is the compulsively readable, often bizarre true-life story of American spymaster James Jesus Angleton. Capturing the extent of Angleton's eccentricity, duplicity and alcohol-fueled paranoia would have challenged the writing skills of a Le Carre or Ludlum, and Jeff Morley has done it with flair." Stephen Kinzer, author of The Brothers, remarks, "Americans are finally coming to know the Cold War spymasters and other hidden figures who lived their lives in secrecy while shaping our national destiny. The Ghost reveals a fascinating chapter of this hidden history. It is a chilling look at the global power that is wielded in Washington by people who are never known--until a book comes out to spill their secrets." Mr. Morley will sign copies of his book following the talk. Books will be available for purchase. Friends Speaker Series: Chef Mary Ann Esposito, Host of TV's "Ciao Italia"
Mary Ann Esposito is the creator and host of the nationally televised PBS series, Ciao Italia with Mary Ann Esposito. Through her program and her books, she has brought Italian cuisine, history and tradition to millions of Americans. This year, the series celebrates its milestone 26th season, making it the longest running cooking series in television history. Esposito has worked beside world-renowned chefs such as Julia Child, Todd English, Daisy Martinez, Sara Moulton, Jacques Pepin, Martin Yan, and many others who share the same passion for cooking. Countless organizations have recognized Esposito for her efforts to preserve the traditions surrounding Italian food and culture. In 2013 she received the Order of the Star of Italy Cavaliere award from the President of the Italian Republic as well as the Premio Artusi award for her work in promoting Italian food. Johnson and Wales University presented Esposito with their Distinguished Author Award. St. Anselm College conferred an honorary doctorate for her dedication to teaching and preserving authentic Italian cuisine. The Italian Trade Commission further distinguished Esposito by naming her a 2010 Hall of Fame honoree. Her most recent cookbook is Ciao Italia: Family Classics. Fellow celebrity chef Mario Batali praised the book, saying "Like her award-winning TV series, this book will live on for years with all of those who cook her delicious recipes." Chef Esposito will be signing copies of her books following her talk. Books will be available for purchase. Acclaimed Actor Harry Lennix, Star of NBC's "The Blacklist"
Acclaimed actor Harry Lennix will give the Howard Gotlieb Lecture at Boston University on November 16, 2017. He will discuss his life, work, and his experiences in and outside the entertainment industry. Harry Lennix currently stars as Harold Cooper on NBC's primetime series The Blacklist. A native of Chicago, Lennix attended Northwestern University, where he majored in acting and directing, and was awarded the Sandra Singer Scholarship for talented theater students. After graduation, Lennix performed in prominent Chicago theaters, including the Goodman and Steppenwolf, while teaching in the city's public school system. Lennix's first film role was in 1989's The Package, filmed on location in Chicago. Lennix continued working in theater, and the following year, won an Obie award for his portrayal of Malcolm X in The Meeting. After relocating to New York City, Lennix performed in the a production of Shakespeare's Titus Andronicus, a play that would help cement his screen reputation when he was cast in Julie Taymor's film version (Titus) in 1999. For his performance as Aaron, Lennix received both a Tree of Life Award from the NAACP and a Golden Satellite Award from the International Press Academy. Lennix went on to accrue an array of big-screen credits include leading roles in Ray, The Matrix: Reloaded, The Matrix: Revolutions, Barbershop 2, Love and Basketball, The Human Stain and State of Play. He was also featured in Man of Steel and Batman v Superman: Dawn of Justice. Lennix's extensive television credits include the Golden Globe-nominated ABC television show Commander-in-Chief, as well as the FOX series 24, ER, Diagnosis Murder, Dollhouse. Experience the worlds of Paddington Bear, 101 Dalmatians, The Indian in the Cupboard, Little Orphan Annie and others through the eyes of the remarkable people who created them! Join us for a hands-on exploration of the archives of Michael Bond, Dodie Smith, Lynne Reid Banks, Harold Gray and others whose indelible characters have brought magic to generations of children all over the world. William M. and Sara B. Warren Professor of the Humanities Christopher Ricks presents a new series of talks on how Boston University poets, past and present, further the art of Shakespeare. Featuring poems by David Ferry, Louise Glueck, Geoffrey Hill, George Kalogeris, Alberto de Lacerda, Robert Lowell, Jill McDonough, Elise Partridge, Robert Pinsky, Anne Sexton, Derek Walcott, and Rosanna Warren. Part II in a two-part series. Bonnie Timmermann, one of Hollywood's most successful and prolific producers and casting directors, will discuss her life and remarkable career on November 8th as part of our Friends Speaker Series. Timmermann's casting credits include Public Enemies starring Johnny Depp, Christian Bale, and Marion Cotillard; The Insider with Russell Crowe and Al Pacino, which was nominated for an Academy Award and a Golden Globe; Heat with Robert De Niro and Al Pacino; The Last of the Mohicans with Daniel Day-Lewis; and Manhunter. For director Tony Scott, Timmermann cast Man on Fire with Denzel Washington and Spy Game with Brad Pitt and Robert Redford. She worked with Ivan Reitman on Dave with Kevin Kline and Sir Ben Kingsley; Father's Day starring Billy Crystal and Robin Williams; and Six Days and Seven Nights starring Harrison Ford. Timmermann cast Academy Award nominated films Black Hawk Down for Ridley Scott and Quiz Show for Robert Redford. For Roman Polanski, she cast Frantic with Harrison Ford and Emmanuelle Seigner and Bitter Moon with Hugh Grant and Kristin Scott Thomas. She also cast classic films such as Carlito's Way, Glengarry Glen Ross, Dirty Dancing, Bull Durham, Trading Places and Fast Times at Ridgemont High with Sean Penn. Timmermann also did casting on Milos Forman's Academy Award winning film Amadeus. In 1995 Premiere Magazine gave Timmermann one of its own special "Oscars" for casting, and Elle Magazine honored her as an icon in its Women in Hollywood issue for 2009. Her casting and producing files are housed at the Howard Gotlieb Archival Research Center. William M. and Sara B. Warren Professor of the Humanities Christopher Ricks presents a new series of talks on how Boston University poets, past and present, further the art of Shakespeare. Featuring poems by David Ferry, Louise Glueck, Geoffrey Hill, George Kalogeris, Alberto de Lacerda, Robert Lowell, Jill McDonough, Elise Partridge, Robert Pinsky, Anne Sexton, Derek Walcott, and Rosanna Warren. Part I in a two-part series. In association with BU's Department of Romance Studies' Voces Hispanicas/Hispanic Voices and the Center for Latin American Studies, HGARC is proud to present a conversation and reading with Leonardo Padura, Cuba's preeminent novelist and journalist. Born in Havana in 1955, Leonardo Padura is hailed as one of Cuba's foremost contemporary novelists and cultural critics. Raised in the Hidden Generation of Cuba, Padura is world renowned for his crime and historical novels, but is also active in the fields of literary criticism, music journalism, investigative journalism, screenplays and short stories. With his work, Padura says he wishes to engage "the biggest problems of society: corruption, repression, hypocrisy, ideological erosion, opportunism, and poverty." Padura graduated from University of Havana with a degree in Latin American Literature, and is now the winner of prestigious awards such as the Cafe Gijon Prize, Cuba's National Literature Prize, and Spain's Premio Principe de Asturias de las Letras. His crime novels featuring detective Mario Conde are now the basis for Netflix's original miniseries, Four Seasons in Havana. Padura currently lives in his childhood home in Havana with his wife, journalist Lucia Lopez Cole. Padura will be joined in conversation by special guest moderator Professor Katerina Gonzalez-Seligmann of Emerson College. Refreshments will be served following the talk. Friends Speaker Series: Biographer Susan Mizruchi on "Brando's Smile"
Join us for an evening of Hollywood reminiscence as Susan Mizruchi, William Arrowsmith Professor of the Humanities at BU, discusses her latest book, Brando's Smile: His Life, Thought, and Work. Now available in paperback, the book strips away the legend surrounding one of cinema's most beguiling stars, revealing the complex, thoughtful man beneath the surface. Booklist's Eloise Kinney writes, "Mizruchi writes frankly, smartly, and wittily and quotes others as well to 'explore the Brando that was not visible to the world in order to better understand the one that was.'" From Emma Goldman to Martin Luther King, Jr., from the Puerto Rican Independence Movement to the Weather Underground Organization, we'll look at the ways in which resistance and civil disobedience shaped American history. Join us as we experience the tumult of the 20th Century through the archives of the people who shaped it, and consider how their legacy informs present-day political discourse.